These modern quality one bedroom split level apartments have their own access via mahogany decked steps and sun balcony. from the private quayside. The purpose built apartments, built on the riverbank, provide superb views of passing yachts and the marsh beyond. The secluded location and the almost hypnotic effect of the tidal river as it ebbs and flows, will swiftly put you into a relaxed frame of mind. Please note that rates quoted are for 1 bedroom apartments. 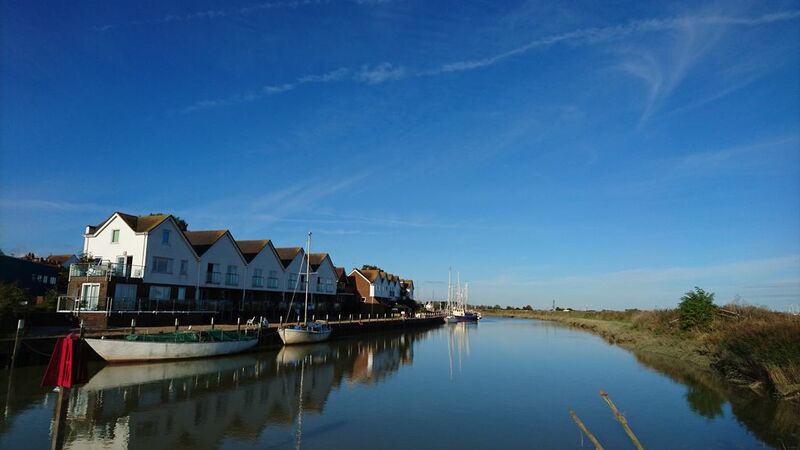 The apartments: The apartments sit on a private quayside with a southerly outlook to Romney Marsh. Rye's cobbled streets are barely 5 minutes walk. Winchelsea, Battle, Bodium, Canterbury, the Channel Tunnel and the Kent countryside are within easy reach. The golf links at Camber are well known and the adjacent Sands are glorious. Other activities include sailing, windsurfing, fishing and walking, with a nature reserve at Rye Harbour. Cycling is an excellent way of exploring Romney marsh, using the tangle of narrow lanes, where you can discover Norman churches and 15th Century smugglers pubs. We spent two fantastic weeks here. This flat is cosy, comfortable and an ideal place to explore some beautiful gardens and National Trust properties from. Arrived to sun on the decking and bubbly in the fridge, what a welcome! Came for a restful break, but have walked miles, around Rye to Rye Harbour nature reserve, saw curlews and white egrets, redshank, wonderful photo opportunities. Shower lovely & hot, heating great for evenings. Lovely on the decking just watching the tide and ostriches in field in front! Fish & chips from Kettle of Fish was good. Roasted chicken portions in oven all OK! Live music Ypres Castle Inn – Friday. Another lovely visit to the Boathouse. We have had the most beautiful spring weather. Sun, blue skies and a gentle breeze. Our son & daughter gave is a surprise visit on day 1 to help us celebrate our 25th Wedding Anniversary. Wonderful! We have walked over the marsh to Winchelsea Beach. A ride on the Romney Hythe & Dymchurch Railway took us to Hythe and a long walk along the ‘prom’. Day 3 saw us walking to Hastings (take good maps if you do this). We came back to Rye by train and it was amazing to see how far we had walked. On day 4 we walked part way along the canal and then headed north of Rye to a lovely village called Iden where we stopped for a drink before making our way back. Today (day 5) we walked to Winchelsea for a pub lunch. Thank you Chris for the bottle which helped with our celebrations. We will be back! Enjoyed the apartment, the views & the ostriches. Thanks Chris for the bottle. Weather has been mostly wild, wet & windy. So we visited Dungeness to make the most of the conditions! We saw Derek Jarman’s cottage and garden & went up the Old Lighthouse. Well worth a visit & tremendous views of the shingle peninsula. Good fish & chips at the Britannia Inn. Plenty of good cafés in Rye, best cakes & ambience in the Apothecary? Good meal also at the Ypres Castle Inn. Pity we missed out on the Arts Festival, but we’ve had a great week. This is our 9th visit to the Boathouse! Reading, writing, walking, relaxing. Fantastic! We had a fantastic week in the Boathouse. Flat very comfortable, well equipped. The location is excellent for visiting Sussex, and ….. the weather was superb. In Rye we had dinner at Carey’s for fish & steaks, very good! Also an Indian meal in High Street. Lunch at Ypres Inn, excellent, could have our drinks outside, sitting in the garden. Another fabulous weekend, in spite of all the rain. We so love this apartment, we are so relaxed here, and it gives us such a welcome break from fostering and a house full of children. Many thanks. Really enjoyed our time at the Boathouse. The apartment was very comfortable and clean, with a lovely touch, a bottle in the fridge. Heating was nice and cosy and the electric fire really finished it off. On our first night we went to the Standard Inn and had a really lovely meal – good value. Went to Rye Heritage Centre. It might seem a lot, £3.50 each to see a model of the town along with a commentary of the history of the buildings, we loved every minute of it. We would recommend the Boathouse to our friends and a visit to Rye. Had a fantastic week here – found the Boathouse to be very comfortable and handy location for everything in Rye. We will be coming back – Rye is lovely! Had excellent meals everywhere – Baileys – great steak, Carey’s – seafood platter was impressive, Simply Italian – try the special seafood pasta, it’s delicious! The Ship for real ale and excellent standard of food. Great coffee & cream tea at Tambika near the Heritage Centre too. Jempsons café is reasonable and good food too for a quick bite. We don’t want to leave!! Really enjoyed our stay here. Would thoroughly recommend ‘Haydens’ for proper coffee and delicious fresh lunches. ‘Webbe’s Fish Café’ an absolute must for fish lovers – must book though, and ‘The Lemongrass’ Thai restaurant was also superb. ‘SI’ (Simply Italian) very slick service and good food, we found the ‘Ship’ a little wannabe trendy beach café-ish, overpriced and not that great. Fish platter at Ypres Castle Inn was fabulous as was the fresh fish – crab, prawns, crayfish tails etc from the fresh fish retailer on the quay, behind the playground. Rye was delightful, unspoilt with lots to see and do, some lovely walks to Camber Castle, Rye Harbour and Winchelsea where Spike Milligan is buried. Apartment is v. comfortable and has everything you need, We will definitely be back! PS. The bubbly a very nice touch after a long drive here! (J) As was the milk and tea tray! ? Thank you. In Rye for 12 days. Snow and ice delayed arrival & a challenge to get into apt due to Jackie being in plaster on 1 leg – ice didn’t help!! Apt fab, clean warm & inviting. Thanks v. much for the wine. Our favourite pub Queens Head Icklesham. Bay Tree Gifts for unusual gifts. No supermarket in Rye open on Sundays but Tesco at Ashford/Kingsnorth 25 mins. Wildlife walks out to the Harbour mouth recommended for birdwatchers. So much to see & do in and around Rye even tho’ we lived here for 11 years still find nooks & crannies. Home from home for Christmas!! Our tenth visit to the Boathouse and still the most relaxing holiday. Se easy to get to but so far from the cares of everyday life. We have the sea, the countryside, a superb beach at Camber and the historic town of Rye – and a welcome bottle of “bubbly”. Why bother with the hassle of airports, passports, strikes, transport problems and costs of long-distance travel? Ducks nesting on opposite bank while I enjoyed breakfast on the balcony. One night definitely not enough! We loved Rye and will have to come again for a longer stay. The flat is perfectly situated; extremely comfortable and well looked after. The nightlife is good, if a little too good! I’m here for one full month – lucky me!! So far, having a great time, lovely to see Rye & old friends again. The apartment is clean & the water pressure for shower is amazing – it’s normally awful in rentals. Anne is a wonderful housekeeper leaves everything wonderful. Hamdens in Rye great for breakfast & lunch. Fish Café good but a bit expensive. Had a good curry from The Spice Place on main st and good pub grub at the Royal Oak & other locals. Plan on returning every year. Thanks so much for making my stay so comfortable. I’ll be leaving on Sat and I’m sad to go. Sitting here sipping tea & watching the boats sail by I’m reminded we are all like ships in the wind. Who knows what next year will bring. Anyway, come what may if all is well, I hope to return to No 1 Boathouse next year. Thanks again and thank you Anne for all your hard work. Our ‘Eleventh Hour’ booking was certainly inspired! Fabulous weather everyday. Rye is a delight. Tenterden is also lovely particularly if you like to browse antiques. Comfortable apartment. Altogether a wonderful week. These small apartments are in a good location overlooking the channel and close to the town. We stayed in No 5 and having stayed in many rental properties over the years we were very disappointed. The decoration was tired, all the wooden furniture marked and scratched, the kitchen and bathroom were like something from the 1970s and the bedroom furniture was utilitarian. The wardrobe was not big enough for the two of us and was not tall enough to take coats and dresses. Overall cleanliness was poor and the freezer compartment in the fridge was so frosted up that the fridge didn't cool properly. When we showed him, the owner made no attempt to compensate us for the food we had lost as a result. Sorry but we cannot recommend this property in its present condition. Oh dear, the icebox in the fridge regrettably was in need of a defrost and it seems we were unable to recover from that bad first impression. The housekeeper had reported a heavy ice build up in the icebox but was unable to defrost it in the 4 hour turnaround between guests. The offer to have the housekeeper come back and defrost it was turned down and the complimentary bottle of sparkling Saumur didn’t cut the ice either. This housekeeper gets consistently Good or Excellent ratings on the feedback requests from previous guests. It’s important to let her know where we may have slipped and I did show her the review. She pursed her lips. This apartment (built in the 90’s) isn’t furnished like a Travelodge. For example, it has an antique art deco matching wardrobe and dressing table with inlaid walnut, the coffee table is made from antique pine and so forth – and all have something to tell about their history. The vast majority of my guests love its homeliness and individuality and (as of today) 39 couples have returned to this same apartment, 5 couple have been back 4 or more times, the highest number of returns is 7. “It was excellent the accommodation and very clean. The parking was easy and within walking distance of rye. We had very good meals out, and a great choice. The art work was great, really enjoyed looking at the 10 green bottles, and the picture of the Italian door. The weather was a bonus, sunny days on the beach in September. We would be interested in last minute offers as we have the flexibility with regard to dates. Nevertheless, and am very sorry that this couple are unhappy – because this is the one thing I strive for – I want people to return! There are several pointers here for me. A new fridge has been ordered to minimise the defrosting issue and I have several maintenance tasks identified for when this busy season subsides a bit. Very clean, comfortable and well equipped apartment. Only a few minutes walk from the town. A torch is needed if returning after dark. (as pointed out by the owner on booking) Lots of information and maps to browse. Guest book very imformative about places to visit and avoid. Peaceful location away from the tourist crowds. The view to Rye harbour over frost kissed fields was beautiful. The field opposite, across the river, is home to ostrich and emu's. Very entertaining over breakfast. We would strongly recommend friends and family to this property and would return ourselves. The owner was very relaxed and easy to deal with. The housekeeper was very friendly and informative, nothing was a trouble to her. This is a compact property, which feels quite snug as it is mid-terrace. Very clean with all the appliances you need and a helpful caretaker. Good to have off-road parking nearby too. Although it is close to the town it is a very quiet development, off the beaten track which aids relaxation. Quayside is not always as busy as the photo suggests, but there are still boats around in October & there are fishing boats a short walk away. Good views of the riverbank, so even in autumn some waders can be seen whilst sitting inside. Handy to have a sheltered balcony with chairs and table too. Local walks are easy to find but it is close to the town too. Two RSPB sites closeby - Rye Harbour almost on your doorstep and also Dungeness - which has losts of info. Rye is an attractive town to explore with an interesting history. The train station is fairly close too if you do not have a car (and a supermarket). Lots of restaurants to choose from. We went up to the Weald of Kent as well as the Sussex/Kent coast. The pleasures of Rye's cobbled streets are barely 5 minutes walk. Further afield you are within easy reach of Winchelsea, Battle, Bodiam, Canterbury, the Channel Tunnel and the Kent countryside. Golf: Another good rest from the rat race. We have seen 23 species of birds from this window and enjoyed Rye Harbour & Dungeness. Lovely tea & cakes in Cobblers. Hope to come again!! Rye Treasury good value when too wet for walking we really enjoyed it!! Rye of course & also (a fair distance!) Faversham – with its splendid church – explore well. Food Not sure about those in Rye due to budget – but if you enjoy really fresh fish & chips – try the Mermaid at Old Town front Hastings. SUPER VISIT. ONLY *GREENSHANKS & CORMORANTS (+ DUCKS!) VISIBLE FROM THE WINDOW. Nice to be back. Nice venue. Ski: Lovely apartment + to be able to wash clothes + cook own food when travelling was great. Rye is great + thoroughly enjoyed Canterbury Cathedral. Will recommend to others from Oz. We were both in need of a break and we could not have picked a nicer town in Rye. After the pace of London we found a little piece of England that is still England. Mrs B could not have been more helpful in replacing the C/D player for us, it’s the kindness that makes all the difference. The apartment was clean & very peaceful just suited us fine. Rye has so much to discover. We suggest you just explore & enjoy. Lovely watching the tide boats and various birds. Very clean, cosy flat and welcome from Mrs B. Visited Rye many years ago and still enjoyed its history and quaintness. First few days the weather was beautiful, next few days very good for Oct.
All rates are for 1 bedroom apartments. Minimum stay is 2 nights, costing £220 peak season and £180 low season. Additional nights are £65. Please note that the nightly rates are for additional nights.